BIAS Amp organizes its global amp presets into several categories. The factory categories include Clean, Glassy, Blues, Crunch, Hi Gain, Metal, Insane, Acoustic, and Bass. Each of them contains four amp models that belong to the style of music they are most typically used for. The Custom category contains user-created amp models downloaded from ToneCloud or from your own creation. Tap on any of the categories, and the display will list all the amp models in that category. Then scroll sideways and tap to select the amp model you want. Once the amp model is selected, the control panel area will automatically update to match the selected model. All presets can be edited and saved at any time (including the factory presets). Tap the save icon in the upper bar and then tap Overwrite to overwrite the current preset and save your edited amp. Tap “Save as new” and you can choose to save your edited preset in the Custom category. Before editing a preamp, tone stack, power amp, transformer or EQ, you might want to quickly load a preset for that module as a starting point for your edits. You can find the 'Preset' button on the left side of each module. Just tap it to load or save a module preset. BIAS and JamUp were developed together and seamlessly integrated. Each amp model can be imported into (opened in) JamUp. 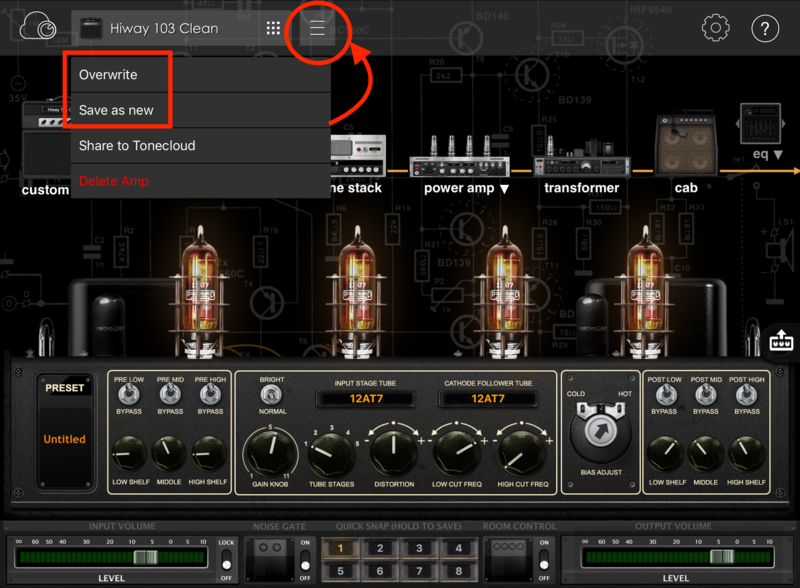 To do so, tap and hold down the gear icon to bring up the integration menu and select JamUp. Once imported, the amp model will be saved as one of the amp models listed inside JamUp, so you won’t need to reopen BIAS Amp to run that same amp model with JamUp again, allowing you to freely use all JamUp features such as 8-Track Recorder, Phrase Sampler, Jam Player, Preset, Live View, and so on with BIAS Amp.